Marshall, Hagen, and Kapps following the world premiere of the sonata at the Wintergreen Music Festival on 25 July 2017. The first movement, “Alla danza tedesca,” is a traditional sonata allegro movement featuring two contrasting themes. The first is an essay in alternating groups of three and four. Either it is an ancient courtly dance, or a game of chess three thousand years ago. The second theme is a brassy, long-lined heraldic fanfare around which purl wreathes of running thirty-second notes. The development section culminates in the second theme’s transformation into an accompaniment figure, over which the cello plays a tune I first rolled out for the finale of my children’s opera “Little Nemo in Slumberland.” The recapitulation takes us back to the ancient world of the first theme. The second movement, “Tempo di ‘Gymnopédie,” returns to the imaginary ancient world; it explores a repeated ground base, over which a sad little Pierrot-esque tune unfolds several times before ending quizzically. The third movement, “Allegro assai” is a nasty, aggressive, technically-challenging little rondo in which a synthetic scale-based set of conflicting ostinatos are cross-cut with an unhinged, obsessively-modulating chorale. I imagine it taking place in a narcissist’s rifled, empty tomb. Based on the tune of the song “quiet nectar” from my 2015 song cycle jaik’s songs, the last movement, “Moderato con moto,” takes place not in an ancient or abstract world but in the comforting / yearning / unsettling world of my youth in 1970s suburbia. The sonata is dedicated to my admired friends violoncellist Sarah Kapps and pianist Peter Marshall, partners both in art and in life. It was commissioned by, and was premièred by the duo, as part of the Wintergreen Summer Music Festival in Wintergreen, Virginia, in July 2017. 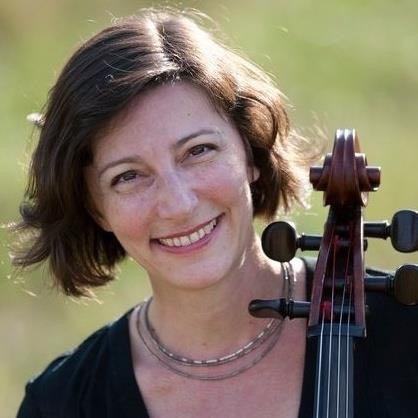 Native Philadelphian, cellist Sarah Kapps has an active and diverse musical background that has taken her across much of the globe as soloist, chamber musician, orchestral member, and rock star. As a performer, she is a sought after and respected chamber musician, often being called on to perform new works. She regularly appears with Atlanta’s avant garde ensemble, Bent Frequency, Paramount Chamber Players, Music on the Hill, as well as countless self-produced chamber and solo concerts. Her first concert of 2015 was a self-conducted concerto performance from the solo seat. In the summers, she has been a long-time member of the Wintergreen Festival Orchestra, Chamber Players, and Academy faculty. She was a founding member of the Red River and Denali String Quartets, and later came to serve on the faculty at The University of Texas Pan-American. In her various positions as instructor, she has taught string methods, music appreciation, and applied strings; as well as broader arts classes, eurythmics, improvisation, lectures, interactive projects, and school visits. She has also been able to make arts advocacy an important part of her mission. She developed an interactive education course that calls on the students to produce their own opera scenes. Through these methods, she has successfully tricked more than one thousand young people into enjoying Mozart operas! Sarah Kapps holds degrees from The Manhattan School of Music and The Mannes College of Music, and has studied with Paul Tobias and Peter Wiley of the Guarneri Quartet. She lives in Atlanta with her husband, pianist Peter Marshall. Known throughout the Southeast for his astonishing versatility and expressiveness at the keyboard, Peter Marshall performs on piano, harpsichord, and organ. He has appeared as a soloist with major orchestras in Atlanta, Washington, D. C. (National Symphony), Richmond, Norfolk (Virginia Symphony), Buffalo, Columbus (OH), and Charlotte, and has given solo recitals in the United States and abroad. Marshall holds the Hugh and Jessie Hodgson Keyboard Chair at the Atlanta Symphony Orchestra, and performs numerous concerts with the ASO throughout the year. Active as an accompanist and coach in Atlanta since 1993, he is in frequent demand as a keyboardist in vocal and instrumental recitals and in chamber music. He has appeared with the cutting-edge contemporary ensembles Bent Frequency and Sonic Generator; with the Southeastern Festival of Song; at the Wintergreen Summer Music Festival; and with the period instrument ensembles Hesperus, Folger Consort, Atlanta Baroque Orchestra, and Grande Bande Baroque Orchestra. Peter Marshall can be heard with Hesperus on two CDs from Golden Apple records; on two upcoming CDs from Centaur Records with violinist Jeanne Johnson; and on a number of recordings with the Atlanta Symphony from Deutsche Grammophon, Telarc, and ASO Media. Marshall joined the faculty of the Georgia State University School of Music in 2001. He chaired the organ department at the Catholic University of America from 1984 to 1993, and served as Chapel Organist at Duke University 1981-84. He holds degrees from Oberlin College and Yale University and studied at the Musikhochschule Lübeck as a Fulbright Scholar.